Blurb: When is a whole more than the sum of its parts? When it has ties to the quaint little town of Ruthorford, GA, as Morgan Briscoe discovers when a cryptic message threatens to change her life forever. Morgan’s relatively normal life is turned on its ear when she learns not only that she is adopted, but her birth parents are dead and she now holds half-interest in a business with their ward, Dorian Drake, who, despite his riveting good looks, can barely conceal his hostility toward his new partner. My review: As much as I enjoy my usual assortment of fast-paced paranormal and fantasy novels, taking an occasional break with something a bit slower is great. My last such 'break' enabled me to fall into The Shoppe of Spells by Shannon Grey. Morgan is an independent woman and recently unemployed when the story begins. Prone to nightmares since she was a child, she hasn't had one in a while, and is surprised to wake up from one, thinking she sees shadows in her room. She also has strange green 'cat-like' eyes--similar to those of her cat, Mrs. T--which a doctor had described as an "anomaly." She has a good relationship with her parents and is tight with her best friend, Jenn. But Morgan's life will be shaken when she receives a letter from a law office. One mysterious phone call later, she finds herself agreeing to visit Ruthorford, Georgia, but she has no idea this trip will turn her normal life upside down. Ruthorford is a cozy, picturesque town with engaging residents. One person she is immediately drawn to is Dorian, the owner to a shop she has now become co-owner of. And those shadows, in addition to her eyes, will play prominent roles in her 'new' life. This is one story I do not want to talk too much about and spoil the fun for anyone. 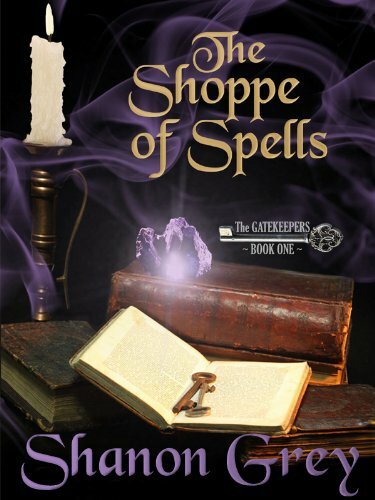 If paranormal is your favorite genre with a touch of romance and fantasy, Shannon Gray's first book in her new series, The Gatekeepers, is a title to add to your list of books to read. Morgan and Dorian's story was entertaining and I found both immensely charming. The lore of the shadows, the Gulatega, and the premise of the 'coupling' concept--how they 'sync' when together and develop new abilities--was intriguing. I really got a true sense of who Morgan and Dorian are, the base of their mutual attraction, as well as their individual powers. Their romance was sweet, spicy in spots, and believable. Many of the secondary characters helped keep Morgan rooted, especially her parents and Jenn. Having the whole town help Dorian out was endearing and I liked the rapport between him and bed and breakfast owner Theresa. Grey took her time building her characters and their settings, and teased us with the slow revealing of powers. There were times I wished Dorian would help kick up the pace by being more open with Shannon. I related to her insecurity over her feelings for Dorian and for remaining in Ruthorford. Even though I didn't like Jasmine in the beginning, I did find my opinion changing by the book's end. I'm so glad she will be featured in the second book, Meadow's Keep. I look forward to seeing what the author continues to create as she releases new titles in this new series. I also hope to read more about Jenn, John and the mysterious Abbott Industries in the future. Sit back, get comfortable, and let The Shoppe of Spells and Ruthorford's inhabitants enchant you. Favorite excerpt: "Dorian led her around the pool, jumping over the tiny creek and moving around the side of an ivy covered slope. He stopped in front of an opening. If he hadn't stopped, she would have walked right past it. He led her inside the cave. About twenty feet in, the passage narrowed and darkened. "I know you can see in here, but I need some light." He took out a pin-light. He was right. Morgan's eyes adjusted quickly. She could see fine. Funny, that had never occurred to her. She thought everyone could see in the dark. She followed him along the passageway. The walls here were damp but smelled fresh. Another twenty feet or so and it looked like they'd come to a dead end. Dorian disappeared to the left. It opened into a stone cavern. A pool with glistening blue-green water occupied the middle. He had stopped and turned to watch her expression. Her face lit with surprise; her eyes glistening like the water behind him. He took her hand and led her around the pool to a raised area of stone. He put his hands on her waist and lifted her easily until she sat on the edge. He pulled himself up and sat beside her. "Welcome to my grotto."" Cover comment: This cover is an improvement over the first one which I found dull and uninspiring. At least this picture gives you an idea this story is about magic and spells, though I find it a bit old fashioned and Gothic looking. Book source: Received from author for my honest review during a (cancelled) book tour. This sounds like a good read and I have never heard of it. Thanks for the share! Thank you for your review. I am so glad you like Ruthorford and the people there. I appreciate you taking the time to do such a thorough review. I believe it helps readers get a sense of what's ahead. Pennyroyal ~A Ruthorford Holiday Story~ is about to be released and I am hard at work on Jasmine's story, which I hope you will enjoy. Thanks again. It was a treat to find this. this book seems very interesting!